Leading innovator of LED lighting and semiconductor products, Cree has introduced an LED bulb that can replace the 75W incandescent bulb and uses 82% less energy. The company claims it will last 25 times longer than its energy guzzling equivalent. The brightness is an adequate 1,100 lumens. A fluorescent bulb of this brightness would consume about 20 watts. Great things with LED bulbs are that they can be build dimmable. So are the 13.5W Cree bulbs. You can set them to achieve a very high brightness when needed, and you can simply dim them to save energy when the extra brightness is not needed. There has to be something that makes the Cree bulb that expensive. 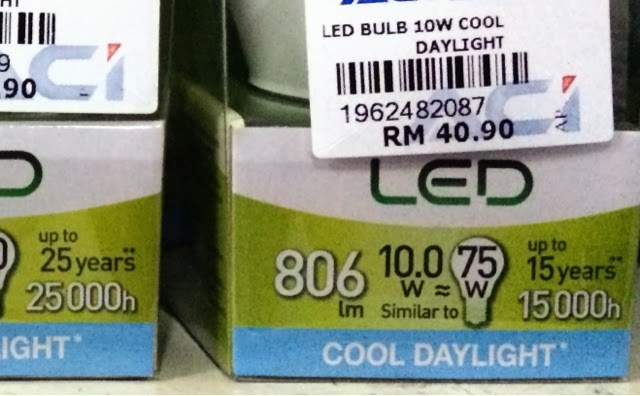 The last time I checked, our local market price range for LED bulbs of 5W - 10W is RM30.90 to RM40.90. Still, the acceptance by the general public is low for this type of lighting. This Panasonic 10W LED bulb is claimed to be the 75W equivalent of incandescent bulb. Priced at RM40.90 in Kota Kinabalu. TheGreenMechanics: Energy saving compact fluorescent lamps (CFL) are available on the cheap at RM11.00 to RM18.00 (13W - 23W) and the price is dropping further. You can expect the LED lamp prices to drop substantially, too. And thanks to time, we shall have cheaper green energy.